This in my eyes is pretty amazing. 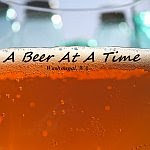 Last year at its release, it was a new Spring seasonal that really made a buzz in the craft beer world. A dry-hopped imperial IPA that honestly topped a lot of what Pyramid had been doing at that time. It was in 6-packs, and 22oz. bombers at it's first release, and the prices were that of their regular beers... which I must say, are usually quite fair, and less than a lot of the competition on our grocers shelves. I just saw it tonight in the 22oz. bomber, bought two for $2.99 Ea. That is an amazing price for a very good and hoppy imperial IPA. I am drinking one as I frantically type out this post. Can you tell I am a huge fan? I haven't yet tried their CDA, Discord Dark IPA, that has been released, and really look forward to trying it. Last year at this time when Outburst was released, it vanished as fast as it came. I think that rang a bell at Pyramid. Therefor, they are jumping at the opportunity and making it a year-round release. This is a smart move in my eyes. They went back to their old labeling, which was also another very smart move. I guess MC Hammer's previous design didn't work out so well for them. I suggest if you haven't already yet, get the brew, and enjoy it. 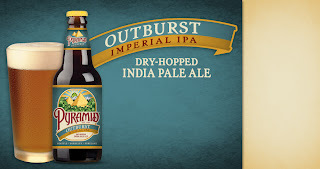 I have a feeling that an IPA of this caliber and price will take a lot of sales away from the competition. This is a good thing. 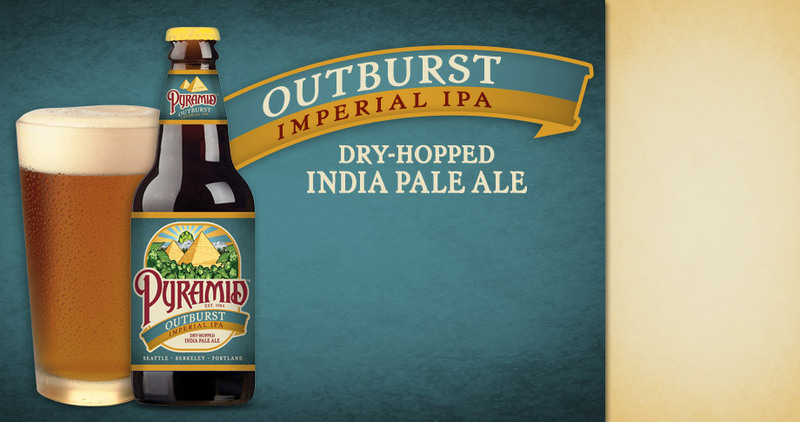 Everyone continues to blather about how good Outburst is and that it's available year round now. Where? It's almost June 2012 and I've been watching for over a year now...nothing. Awesome beer. Currently my favorite and there was a time when I didn't look at Pyramid beers at all.